Did you know that Harpenden Rural is home to two golf courses, one rugby club, a pub, and a church? As well as the oldest continually operating agricultural research station in the world – and an ancient burial ground? Please scroll down this page to read more! The parish can claim just part of the course at Harpenden Golf Club, but Redbourn Golf Club and Harpenden Rugby Club are wholly within the parish boundary. The Fox is the only surviving pub; there was another called “The Whip” but this has for many years been a private dwelling. 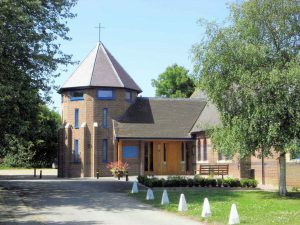 Our church is St Mary’s, one of the three churches making up the Church of England Parish of Harpenden. St Mary’s has a hall for hire used by community groups and private hirers. The Brownies meet in the church hall; also neighbouring the church is the the headquarters of the 9th group and Kinsbourne Explorers group of the Harpenden and Wheathampstead District Scouts. The parish is also home to Rothamsted Manor House and Farm; likewise much of the research and trial grounds of Rothamsted Research. The campus buildings and centre address however come under Harpenden Town Council. The footings of a Romano -British enclosed burial ground constructed for the use of a high status family during the 2nd century AD are located on Rothamsted Farm. A number of artefacts found in the 1930s are held by St Albans Museum. Harpenden’s Local History Society’s website is a treasure trove of information. The logo above links to the Society’s home page for you to explore their entire repository of pages and articles; however there are specific collections of articles on Rothamsted and Kinsbourne Green you might be interested in. There are many pleasant walks within the parish, including a number of footpaths on the Rothamsted estate. Parts of the River Ver Trail forms the parish’s south-west border, from Junction 9 of the M1 to the start of the Nickey Line Path and Cycle track (at the roundabout going from Redbourn to Harpenden). Both The Ver Valley Society and The Nickey Line have websites with a number of linked walks.